Just 850 m away from Dwarka Sector 13 Metro Station, Radisson Blue Hotel has restaurants, bar, conference facility, pool, spa and Wi-Fi internet. Radisson Blu Hotel Dwarka is a 5 star property located in Dwarka, New Delhi. It has 217 well-furnished rooms with modern amenities, like Wi-Fi internet, LCD TV, mini bar, tea/coffee maker, hair dryer and work station with data port. Some nearby attractions to this hotel are Pacific Mall, Ambience Mall and Janakpuri District Centre. This hotel also provides facilities, like doctor-on-call, laundry, airport transfer, foreign currency exchange, fitness centre, swimming pool, spa and salon. It has three meeting rooms and banquet space for conference, business meetings, seminars and social functions with catering arrangements making it an ideal option for business travellers. Spring: All day dining at the multi-cuisine restaurant sumptuous buffet and a la carte meals. Its buffet meals are popular among guests and known for their variety. Enjoy a wide range of alcoholic and non-alcoholic beverages to complement your meal. Atrium, The Tea Lounge: Experience classic English culture with exotic flourishes while you sip Afternoon Tea and nibble on a delicious selection of cakes, pastries and savories. 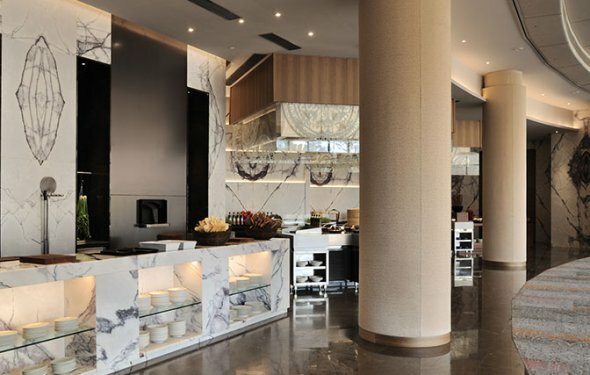 Rice, The Pan-Asian Restaurant: The highlight of Rice is its interactive kitchens, enabling guests to enjoy the experience of watching their meals being prepared according to their preferences. If you would like your family dinner to have a touch of class, you'll love the moderately priced dishes at Rice. Zeppelin, The Bar: Entertain business colleagues or enjoy a quiet evening alone at Zeppelin, the Radisson Blu's stylish lounge. Boasting a variety of exotic cocktails, choice wines, handpicked single malts and spirits. Dvar - Gateway to Indian Cuisine: Recreating the food that India is best known for, Dvar offers grand traditional Indian recipes while exploring the new age of exotic Indian flavours from the four corners of the country. If you would like to spend the evening in your hotel room, make a selection from the convenient room service menu. Excite your palate with freshly prepared delicacies from across the globe.